In need of a spark of creative energy, I checked out this great post by Kathleen Morris over on The Edublogger. I found a prompt that mentioned making a blog post into a video using a tool called Lumen5. This tool uses AI to create attractive videos by pairing and animating images or GIFs with pieces of text. The text can either be copied and pasted or pulled from a link. So, for example, a student could link to a blog post and create a very cool video in just a few seconds. In fact, Lumen5 lets users add a site or blog’s RSS feed to automatically create a new video whenever a new post or article is added. You can go in and pic specific design styles, change images/GIFs, choose music, etc. as needed, but it really does a pretty amazing job automatically. Lumen5 does require membership to use, but you can currently join for free and create unlimited videos. Paid subscriptions allow for HD rendering and removes branding (in the form of a slide at the end of each show) from videos. Paid subscriptions also allow for the creation of collaborative teams, while free accounts do not. I have to say that I really like the potential here. Like most folks, I will admit I am more likely to watch a catchy video than read a long treatise, at times. I like how this opens up both options. 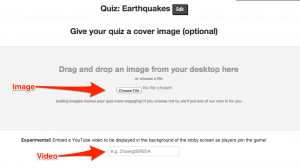 One tiny improvement that would be useful is the ability to embed videos in blog posts. While they can be automatically shared to multiple social media sites, I cannot find a way to embed beyond downloading a copy, uploading it to Youtube, and embedding the video from there. 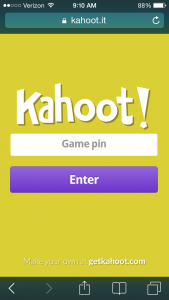 Get started by registering at https://getkahoot.com. Once the account has been created, you will be taken to your dashboard. For this quick intro, we’ll create a quiz. Type the first question and set the question options (for points or not for points; time limit). If desired, an image can now be added to the question. Below the image, enter the answer choices. Select the answer that is correct. Now add another question. Click the Add question button at the bottom of the screen. Repeat for as many questions as are needed. When all questions have been entered, click Reorder questions. Questions may be rearranged by simply clicking and dragging up or down the list. 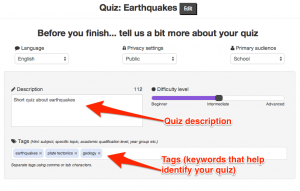 Click Next: settings, then select the quiz’s language, privacy settings (public or private), audience, and difficulty level (Beginner; Intermediate; Advanced). 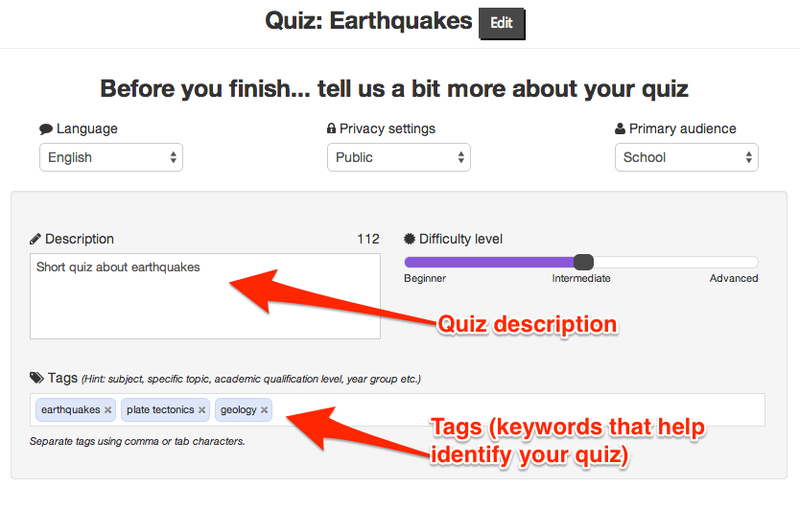 Type a short description and enter a few tags, which will help others find your quiz. It should be noted that at any time in this process, you can go back and change your questions by clicking the Edit Questions button at the bottom left of the dashboard. If desired, add an image for the quiz’s title screen here. 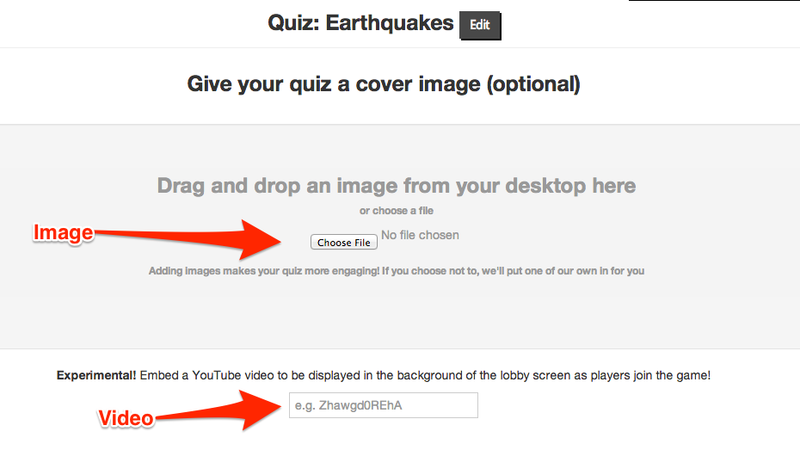 Optionally, you can embed a YouTube video that will play as students wait for the quiz to begin. Your quiz is all set. Now, gather around those students and have them get out whatever internet-connected device they wish to use. Start the quiz by clicking Play Now. On the next screen, there are a few quiz options. It might be a good idea to turn on the “Display game-pin throughout?” option, in case students are late getting logged into the game. A warning: the lobby music option is eerily reminiscent of an elevator, only more grating. 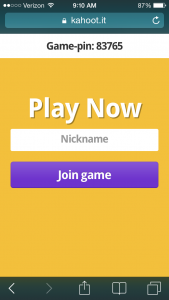 Students next create a player name and click Join Game. 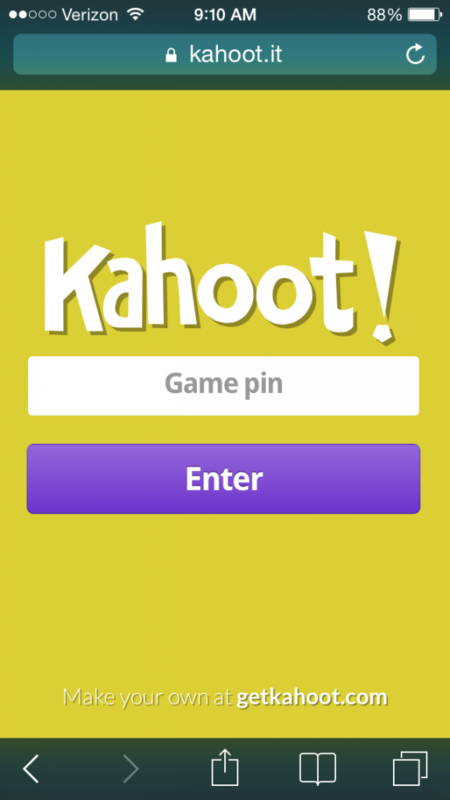 They’ll see a confirmation screen, and the teacher’s screen will display the student’s game name. When ready, click Start Now to begin the quiz. 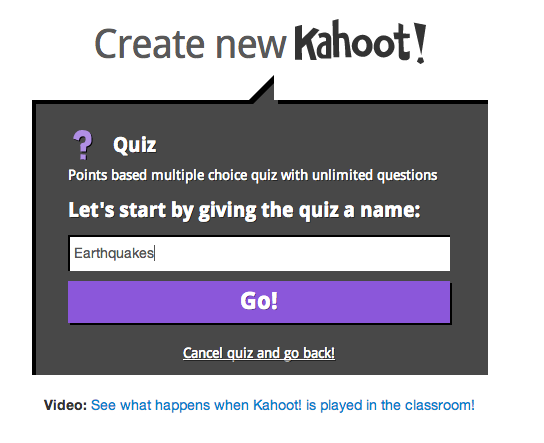 The first question displays for a few seconds without showing the answer choices, allowing students time to think before clicking. The answer choices and a timer then display. Students choose the shape/color that corresponds to their answer choices on their devices. 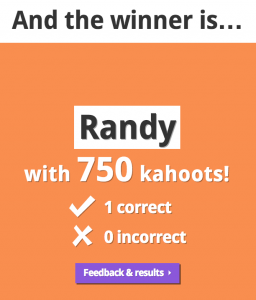 When the timer expires or all students have answered, click Next to see the class scores. Students score points for accurate answers and for the speed of their responses. 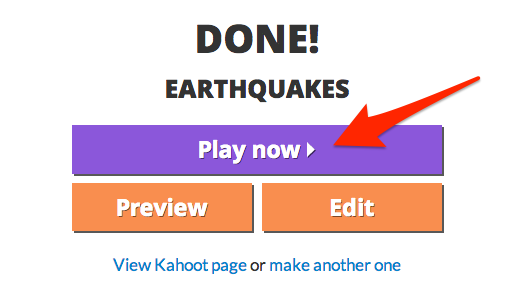 When all questions have been completed, click the End button to stop the quiz. 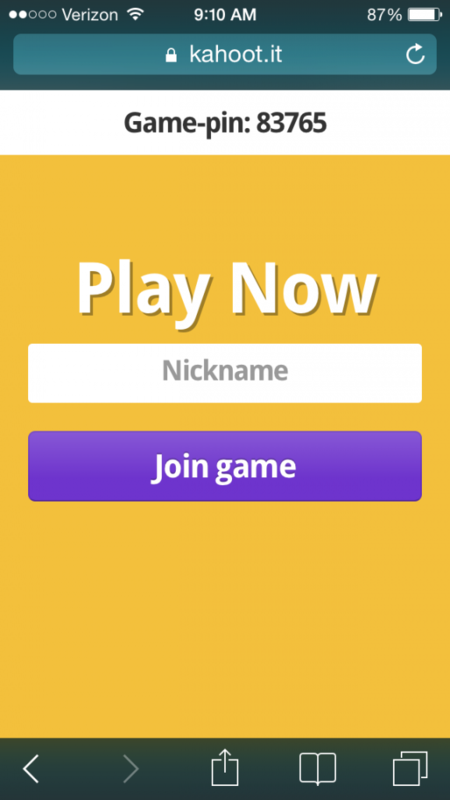 A result screen will appear announcing the quiz’s winner (It helps to be playing against no competition.). 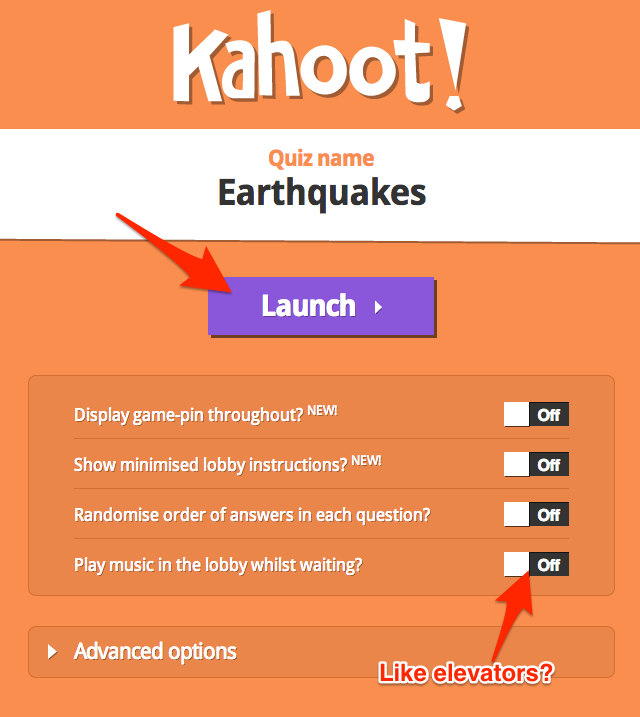 The Feedback and Results button allows participants to rate the effectiveness of the quiz, including how fun it was, whether or not they learned from it, etc. 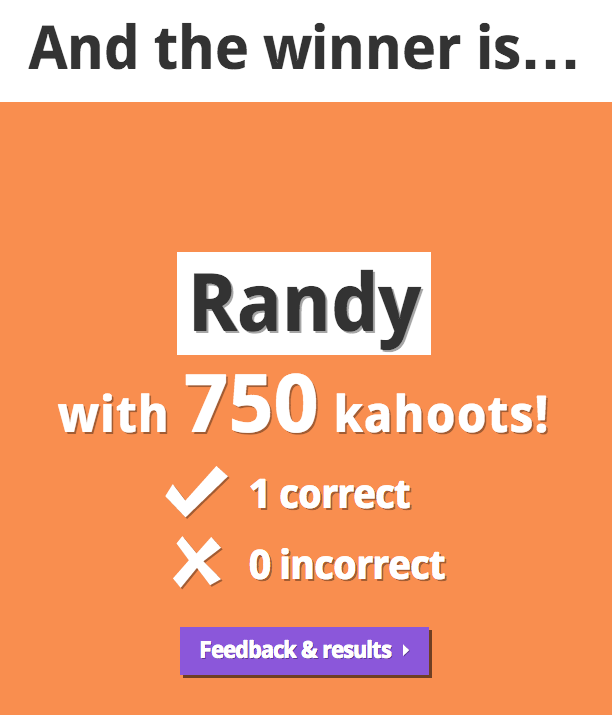 Finally, click the Final Results button to view all of the quiz’s data. A helpful Download Results button gives teachers a handy spreadsheet with student responses to each question. That’s all there is to it. Well, it’s actually not, but that is enough to get you started. You should also take the time to check out the thousands of quizzes, polls, and discussions created and shared by other users–might be a great time-saver. From your dashboard, just click on the Public link at the top of the screen. You’ll be able to search by topic, intended audience, or activity type. 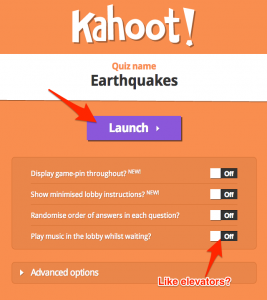 I think you’ll like the usability of Kahoot! and the level of engagement you’ll see in your students. If you have any thoughts, ideas, or questions, please share them in the comments below. Best wishes for an incredibly successful school year! BYOD (Bring your own device) initiatives have been around for more than a decade now in one form or another in schools and businesses. As I conduct workshops or engage in conversations with teachers on using student-owned mobile devices in the classroom, there is almost universal agreement as to the incredible potential of today’s pocket-sized supercomputers. There is, certainly, some trepidation, as well–questions regarding discipline, management, privacy, theft, etc. The thing is, while these concerns are not unjustified by any means, we are not blazing a new trail here. Thousands of classrooms have gone before us, and there is a mounting evidence in the research of the benefits to students of the well-planned BYOD program. For those on the precipice, here are 3 painless ways to test the waters when school starts this year. 1. Student Planning/Scheduling –Instead of having students copy assignments off of the dry-erase board or projector screen every Monday morning, as is the ritual in countless classes, have them use their cell phones’ calendar apps to save assignments, due dates, etc. As quickly as young fingers nimbly text on their tiny keyboards, this isn’t likely to take up more time than having them use paper and pen. It’s also more reflective of what most college students or adults would do in 2014. My daughter’s principal told me last week that students at her middle school will do this starting this fall–kudos to Mr. Garza for a great first step. 2. 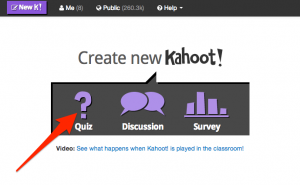 Class Backchannel –Using free tools like Todaysmeet, Google Forms, Twitter, etc., teachers can easily leverage student devices to gather student observations, understandings, and questions. These can be used for quick formative assessment during class to re-direct activities or instruction as needed to clarify or correct misunderstandings. By creating a unique class hashtag (e.g. #mrsmithsmath), Twitter goes from a potential distraction to a very powerful group discussion tool, and it is not necessary for users to follow one another to utilize a common hashtag. Just search for the hashtag within Twitter and see the entire discussion at once. 3. Podcasting –Class podcasts, especially audio podcasts, are very easy to create and provide a powerful tool for archiving student learning, sharing creative works, communicating news, and more. If you’re still not sure what a podcast is, it’s like a TV or radio series, only based on the web. Here’s an example by an educator friend, Technlandia. The great news is that it doesn’t take incredible techiness to be able to put together a show like this. Basically, you or your students record an audio file and upload it to a host site, like Podbean or Podomatic. Even easier, try a tool like Audioboo for Education. Audioboo’s app is ridiculously simple to use. Students can quickly record, title, tag, and upload audio podcasts to their own or a class podcast. Ease into the idea by having a student record announcements into a daily/weekly class podcast, then move on to letting a student share a short summary of the day’s lesson(s) at the end of class, share their writing, etc. 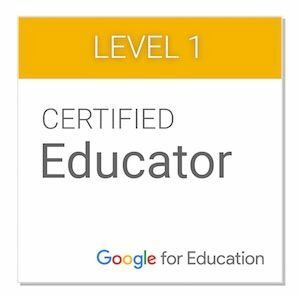 These aren’t flashy, but they’re easy to get you and your students started. The aim is to give students opportunities to leverage the bigger capabilities of their phones and get students viewing their phones as something more than entertainment or 24/7 pipelines to their friends. Not an easy task, but management gets easier as the novelty fades. I’ve heard of teachers using many different strategies to varying effect. At the outset, a simple technique is to require phones to be left face-down on the desk’s corner when not being used instructionally. 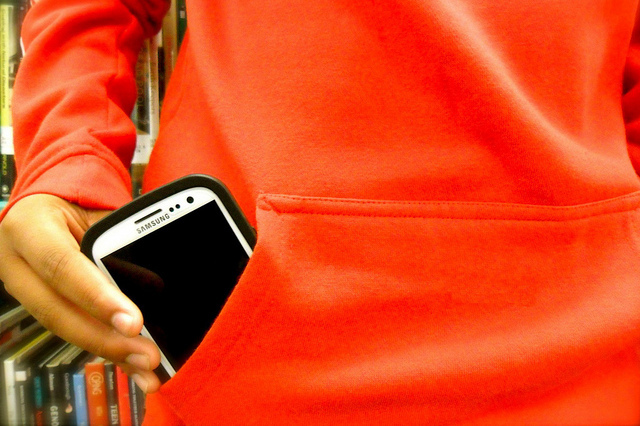 If you’re planning on giving BYOD a shot this year, good luck! It’s likely to be a learning process, as with any resource, and you and your kids will come to see ways to use the devices naturally and effectively with practice. The video below is a very quick overview of Pixiclip, a free, online whiteboard that is a potentially very useful tool for teachers looking to create online tutorials, particularly for flipped classroom applications. The site allows text, drawing, images, audio, and even webcams to be included in presentations, and it has a very user-friendly interface. So, What’s in Your Browser? Many folks still don’t realize that the browser they are using at this very moment is designed to be customized. Chrome, Firefox, Safari, Opera, even Internet Explorer–all have some really cool and powerful add-ons (called extensions) that do countless things, from blocking annoying popups to checking spelling to making sites more easily readable for people with visual impairments. You name it, there is probably an extension for it. As a way of an introduction, I thought I’d share a screenshot of my own Chrome toolbar and the extensions that reside there currently (It’s a fluid list.). 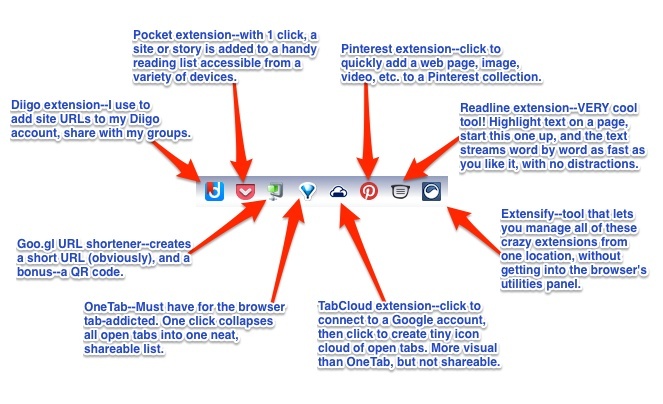 More Chrome extensions can be found here, and Firefox extensions here.